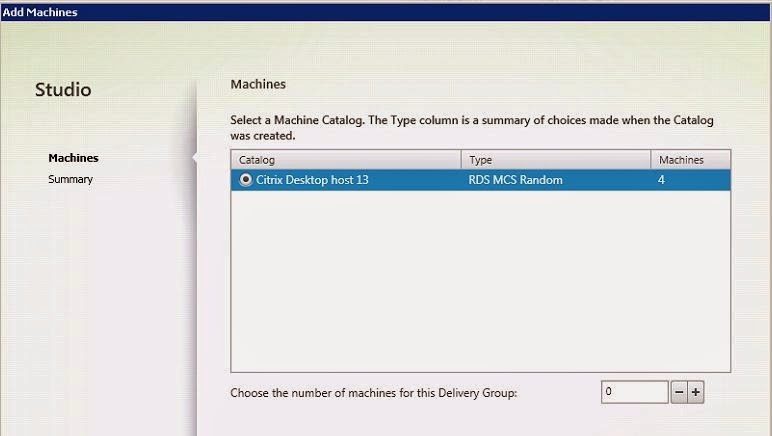 In this blog I will show you how to setup a Citrix XenApp delivery group when you have a Microsoft Hyper-V environment with FusionIO and not SAN storage. 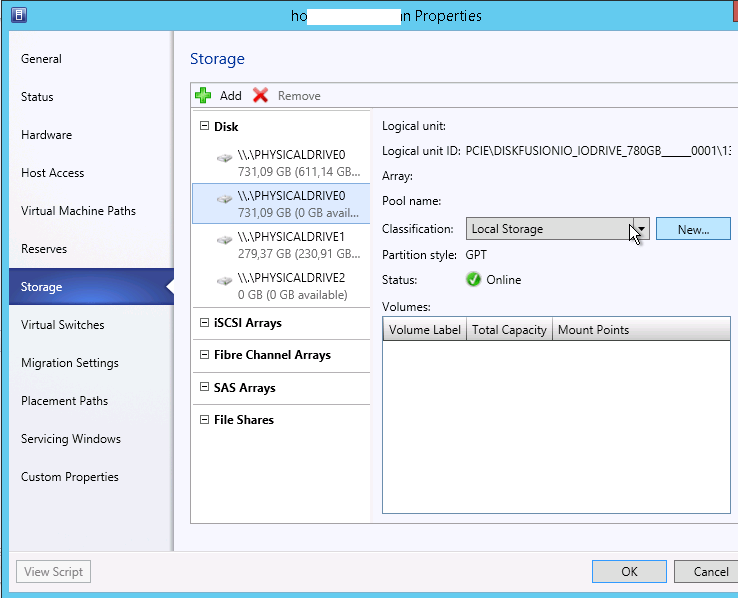 The mention of no SAN storage is important for that is the reason a cluster cannot be setup. With a cluster you could address the resources as one. 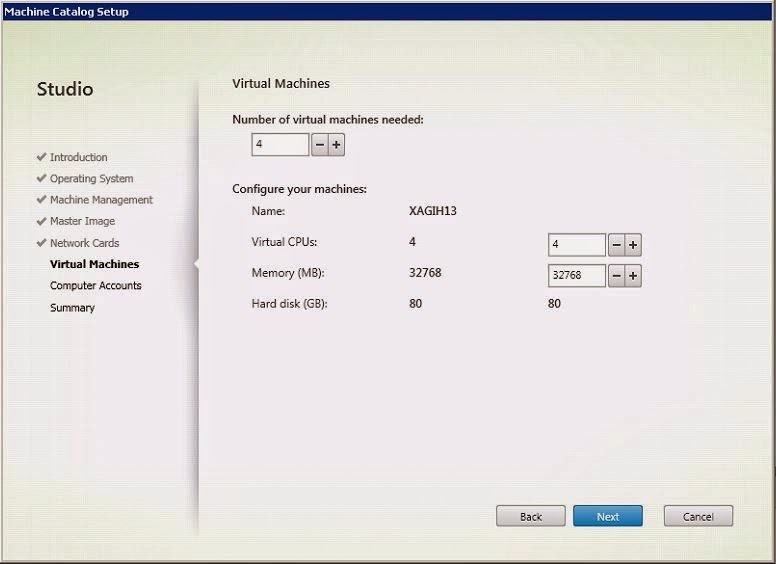 Without a cluster each Hyper-V host is an island and has to be treated like that. Let’s take a quick look at my environment, I’m dealing with a normal sized Dutch customer. They have about 250 users (in the US this would be small) which is average here. They have about 200 applications and each user will run about 10 of them concurrently. The Citrix version they are going to use is 7.6 and they will use the Platinum license. 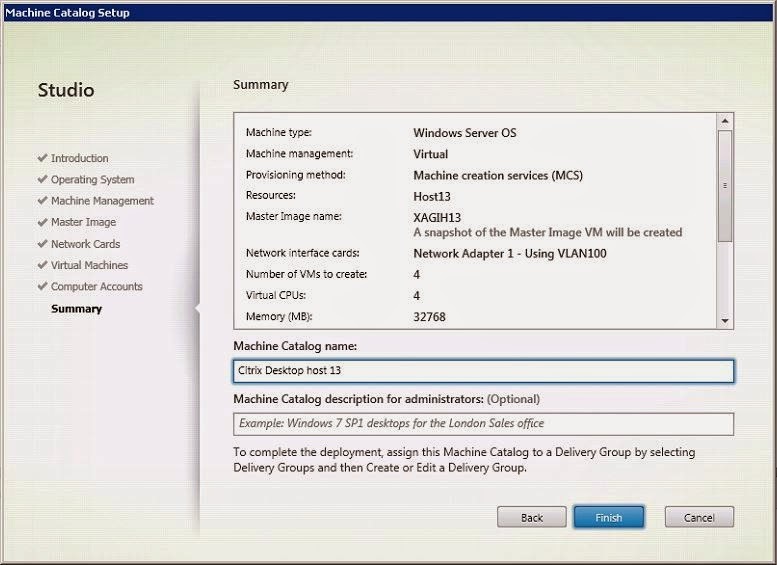 The hypervisor has been chosen (by the customer) to be Microsoft Hyper-V 2012R2. UEM will be handled with RES Workspace Manager. Local application Access will be used for they have very freaky apps that don’t run that nicely in a centralized environment. For deployment of the Citrix servers and the clients we will use Microsoft SCCM. The back-end hosts have, of course, SAN storage and the front-end hosts have FusionIO cards installed. The Front-end hosts have no SAN connection. here’s a screenshot of the storage/hosting conncetions. From a SCVMM point of view it looks like this, FusionIO card in the host that is used to deploy the XenApp servers to. The network is split in two VLANs, 8 voor deployment and server communication and 100 for clients. Because the XenApp servers are client-faced servers they will reside in 100 after being deployed in 8. 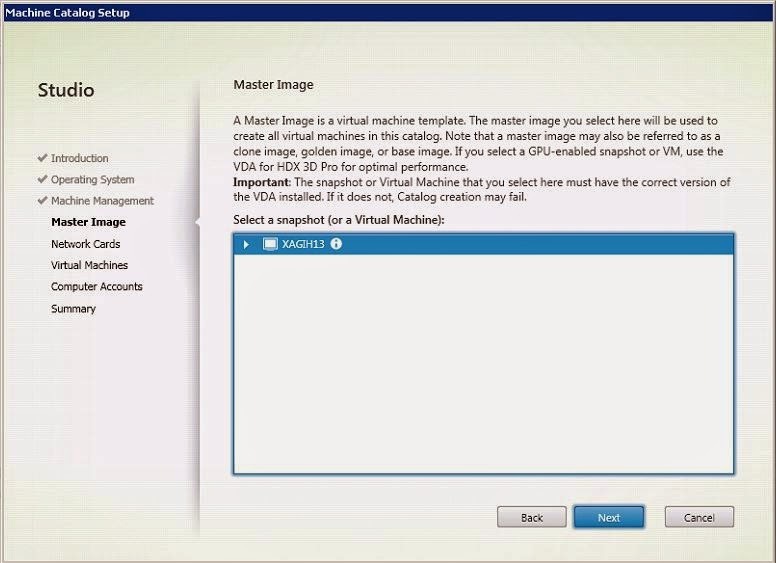 We deployed a golden image with Microsoft SCCM to all four Front-End Hyper-V hosts. So that’s were we start. Our goal is to create one delivery group to span multiple catalogs, so let’s first start with the catalogs. 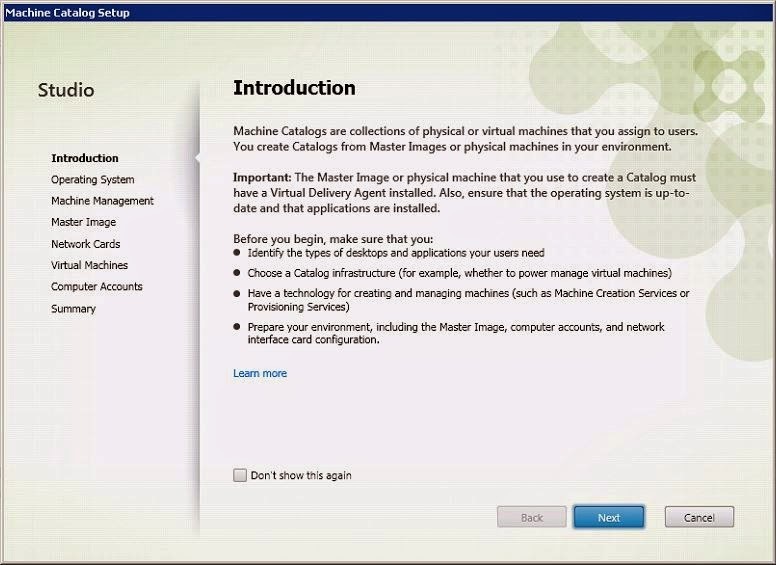 We need to create four catalogs for each Hyper-V host one. So let’s start with one of them, I will show you the creation of the catalog on Host13. It’s the wizard from Studio we will see most of the time. 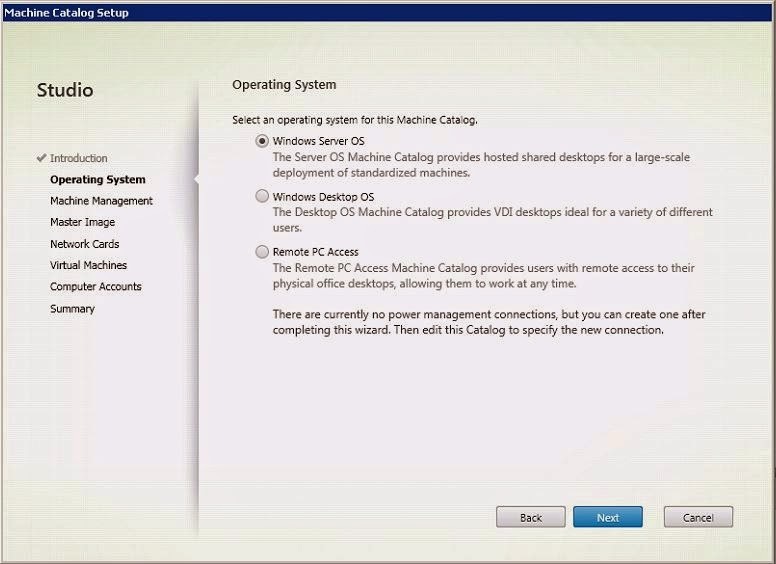 I selected Windows Server OS for we will be using Citrix XenApp 7.5 here. 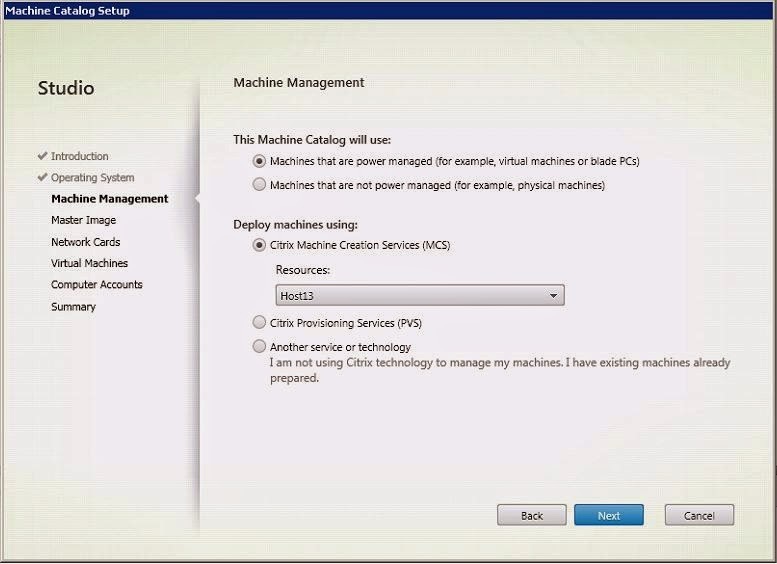 I use MCS provision mainly because the customer has limited skilled Citrix administrators and MCS simply requires no knowledge of the process at all. So I chose Host13 in the resource selection, each host is added as a separate resource. As mentioned before we deployed a golden image to each host, on host 13 it’s called XAGIH13 which I thought was a logical name. To deploy with Microsoft SCCM we needed a legacy network adapter as I mentioned in a blog yesterday. I don’t want to use a legacy adapter in a production Citrix environment, it’s not called legacy for nothing. So I added a network adapter to the virtual machine and connected it to VLAN 100. 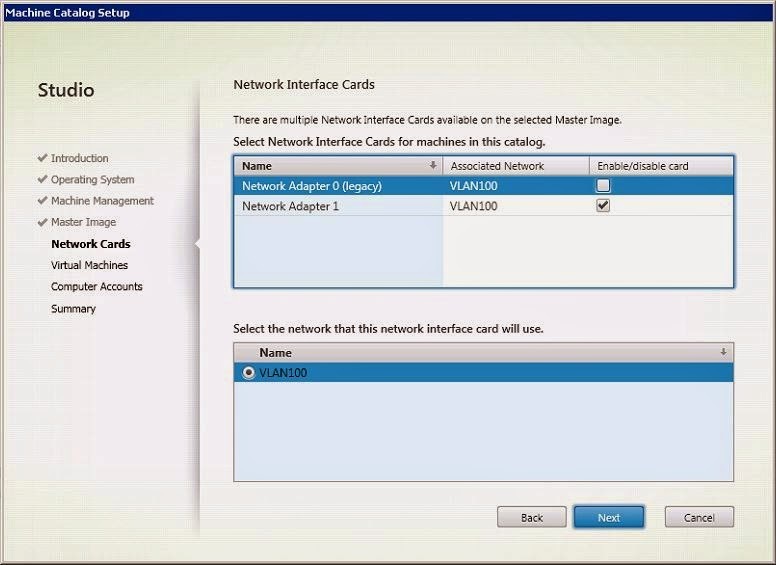 So in this screen I deselect the legacy adapter and select VLAN 100 to be used. Mind you I started the machine after I added the adapter, just to make sure it was detected. You have to name the OU where to store the new computer accounts and give them a name. I selected XAH13## to easliy identify which host they are on. Last step is the naming of the catalog, again I used the host name in the name to make it easier to identify them. normally with SAN storage you wouldn’t do it like this but with only local storage I don’t see any other option when working with Hyper-V.
… and there it goes…First the snapshot. If you didn’t select one it will create one for you. Next copying the master image to the host. With local storage you will have a master image on each host. Almost there, creating computer accounts in the OU you just selected. Now we’re creating machines on the Hyper-V host through SCVMM. And once you see this you know it’s a success. I created a second catalog on host 15 the same way I created this one. So now we have two catalogs. I had one delivery group already so I want to make sure both catalogs are combined under that one delivery group. Let’s go and find out how that works, coming? As mentioned, two catalogs with each 4 machines. Also one delivery group with currently only 4 machines attached. Click on “Add Machines” in the right hand menu to add more machines to the delivery group. The catalogs have to match to be able to do this. 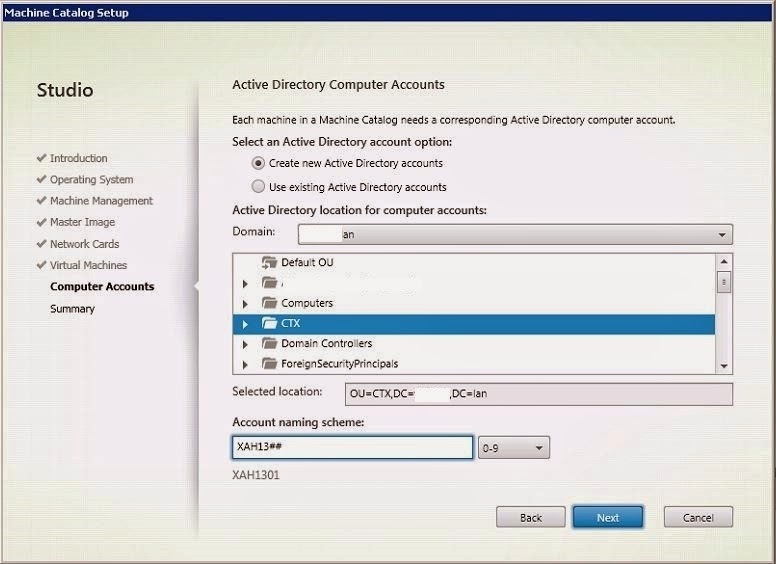 you can mix XenApp and XenDesktop for instance. In the wizard you can select the number of machines for that catalog, I selected four. Looking at the delivery group you see that the number has gone up to 8. In the menu I chose “View Machines” and now I see all the machines in the delivery group and they all are registered just fine. So my environment is half way with 8 machines running. 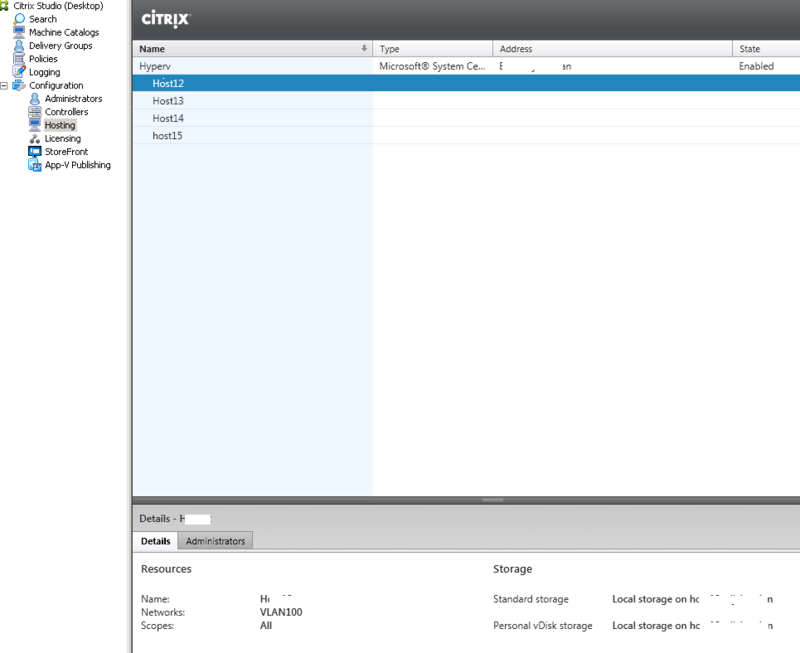 Hope this helps you understand the impact of local storage and Hyper-V with a Citrix environment. Of course with PVS you wouldn’t have this for you would have a central vDisk, with MCS you have to think about stuff like this.